One of the most influential periods in a person’s life is during their childhood. The imagination is one of exploration and wonder. What a student learns between kindergarten and high school can set them up to follow their greatest hopes and dreams. The JCS Visual Arts Department strives to inspire imagination and creativity in a God centered atmosphere. The art classes offered continually challenge students and help them develop their interests, while preparing them academically if they choose to pursue the visual arts after high school. 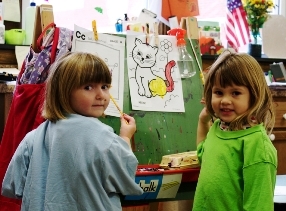 Throughout their education at JCS, students are introduced to different mediums, styles, processes, and genres. Basic vocabulary as well as the elements and principles of design are studied. Once the foundation has been laid students go onto deepen their knowledge and develop understanding while learning new techniques, skills, vocabulary, and general knowledge about specific artists. 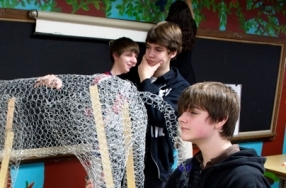 Students encounter a broad range of art media for both two-dimensional and three-dimensional self-expression.